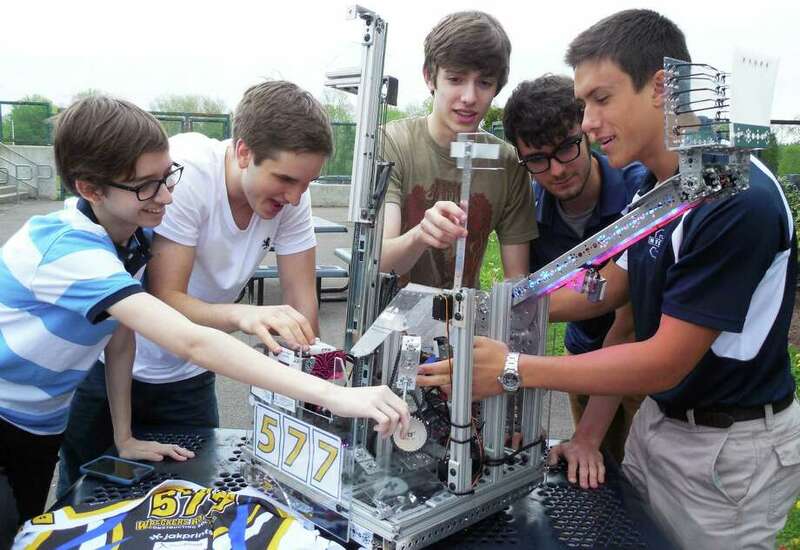 Members of the Wreckers Robotics team at Staples High School with their robot "Brick House." Its name is "Brick House" and it provided a solid foundation for the Wreckers Robotics team -- made up of Staples High School students -- to finish in the top 24 in the recent For Inspiration and Recognition of Science and Technology, or FIRST, World Robotics Championships. More than 3,200 teams from around the world competed during the season with just the top 128 making it to the world championships that took place in St. Louis, Mo., last month. "We heard the song, liked it and thought it just made sense to give our robot that name," said Max Liben, 18, team co-captain. But it's been bittersweet for seven team members, all Staples seniors, who will be moving on to college after their June 20 graduation. That's because even though they will be leaving the team behind, they wanted to make sure the program continues to offer young Westporters a chance to learn and experiment in the fields of technology, mechanics, engineering and design in the same way they did. So they have been recruiting new members for the team, which in 2011 took first place in the FIRST world championships with their unbeatable robot, ARMageddon. That robot is currently on display at the school, along with a proclamation from Gov. Dannel P. Malloy citing the achievement. Liben said team members put up posters at the beginning of the year and interviewed a number of students before selecting new members. "A lot of kids were interested," he said. But more than interest is needed to compete in robotics, which the team hopes one day will be recognized as a varsity sport, mentored by Staples teachers. There's skill, engineering and computer knowledge involved in building a robot and, in competition, sometimes a team just needs luck, they said. Scoring in any level competition is complex, and at some events, involves an "alliance" with another team randomly selected. That can either make or break chances to win, they said, depending on the skill level of the other team. The activity also requires a great deal of time, with this team's members devoting a lot of their efforts to make changes or revisions to their robot. This included spending their spring break on the project, said member Troy Fantini, "even if you had planned to go somewhere." And all that time has been spent in a converted space in Alec Solder's home. Solder, 17, is senior captain of the team and a member of the 2011 first-place team. While it takes time to plan and construct the robot, the hardest part, team members will tell you, is fitting everything needed into the robot's frame. There is also the cost to participate in the events, with some robots costing thousands of dollars to make and maintain. There's also the cost to travel to the events. So fundraising and community outreach, which was the job of team member Chris Severini, 18, this past year, also is important. And, yes, you need good organizational skills like those of Parker Stakoff, 17, who reprogrammed Brick House on the team's flight to St. Louis to cover "every option possible" of tasks the event might require. Wreckers Robotics members remarked how the intensity of competition has increased in recent years and at the number of new teams that have entered the field. Among them is i2robotics, a team also comprised mainly of Staples students, that also competed in the FIRST World Championships and were ranked 38th out of the 64 teams in their division. Venture into the basement of Peter Sauer's home on Grays Farm Road and there you'll find teammates practicing for hours on end, getting their robot, Hephaestus, ready for competition. "We've been working on it since September," said Sauer, the team co-captain, who along with his teammates demonstrated recently how their robot works. This included tasks like gathering blocks or raising a flag. A positive aspect of the challenges is "gracious professionalism," said Alex Davis, 17, team co-captain. "It's the idea of competition, but doing it with good spirit," he said. Sauer said this can be demonstrated when one team helps another if their robot breaks down during a competition. The team is also credited, Sauer said, with helping to eliminate a problem on the playing field: static electricity. The solution was somewhat simple, he said. "An antistatic spray," which FIRST has allowed teams to use during competition. Without it, Sauer said, robots tended to just short-circuit. Although competitive season for robotics ended in April, team members don't plan to rest. They're already preparing for next year's events. In fact, there will be many changes to the robots over the course of the season, Davis said. "It just keeps evolving," he said.